Based on The Spirit Light of Lucifer, combined with the Spook Room, both items manufactured and sold by Floyd Thayer in the 1940s, this new version, touched by a Wizard, uses no batteries, no threads, no sorcery. A genuine clear glass 100 watt light bulb lights up with a full 100 watts of power (no weak battery light). It blinks on and off to answer questions, even while held by a spectator. Then the spirit moves it... lifting it into the air and using it to answer more questions by applying its mysterious light to a jumbo transparent Ouija board. Finally, the medium (that's YOU!) tries to extinguish the light by covering it with a cloth while it is still floating. 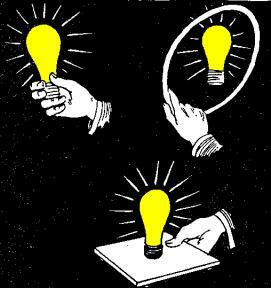 Suddenly the cloth vanishes and is found INSIDE the light bulb just as it lands back in its socket. Disclaimer: The method uses REAL electricity which can harm, burn, or electrocute (kill) the user if improperly used. It is intended only for adults, and those with enough knowledge of electricity to attempt the effect. If in doubt, have a competent electrician check your work! Electricity produces HEAT. The heat can be just as hazardous to your safety and health as the electricity that generates it. Light bulbs are made of glass which can break, and broken glass can also be hazardous to your health and safety. Version 2- a much smaller version uses an incandescent bulb unscrewed from an ordinary flashlight. This version uses invisible batteries but not much else, so the above electrocution disclaimer does not apply. The tiny flashlight bulb, brightly lit, rises from the performer's hand and floats behind this glass bottom tray created by a glass laser process. The tray works with either the 100 Watt Light Bulb (plus a compass rose planchette printed from the e-Book) or just the tiny flashlight bulb blinking on and off behind the tray, spelling out messages in whatever routine you design for it. The X-orcism e-Book is NOT a part of this collection and must be ordered separately. MM3-00 COMPLETE - All 11 Mini-Mysteries!